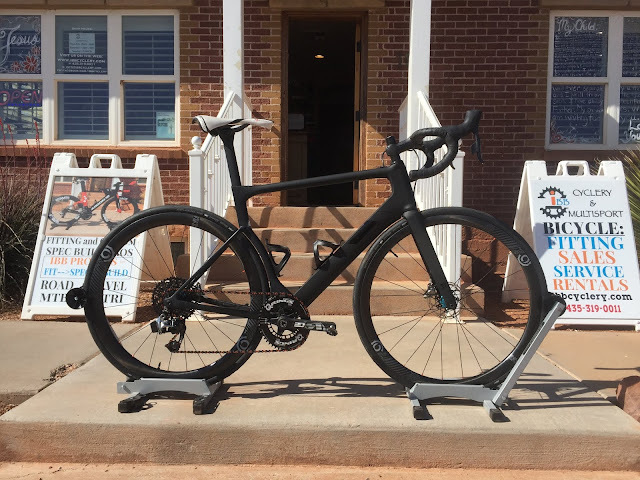 "Planted" - One of the key words the owner used to describe the ride experience of his 3T Strada Custom eTap 1x11 Build. 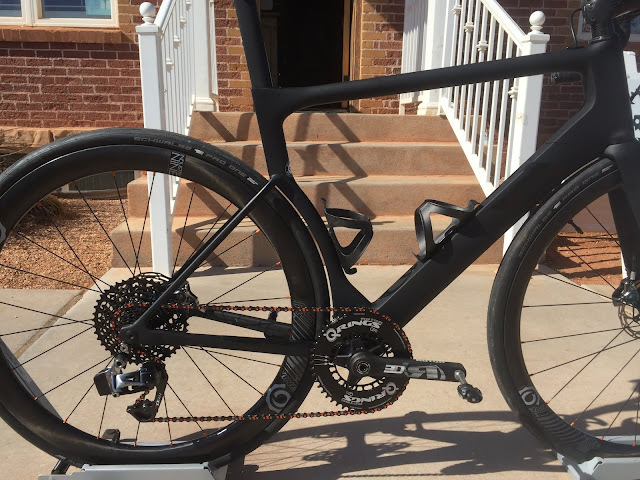 Another beautiful result of the IBB FIT --> SPEC --> BUILD Process, this Custom spec'd 3T Strada exemplifies what is in our opinion the future of road racing bikes. 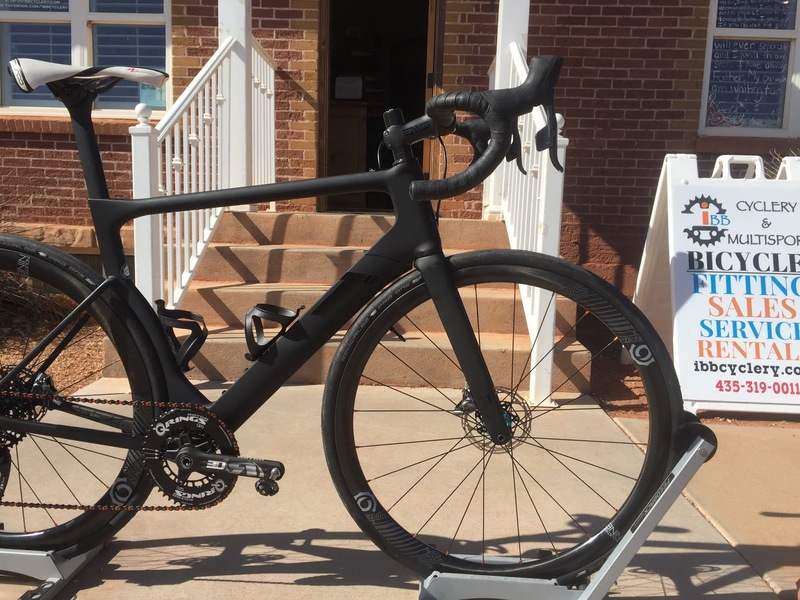 Aerodynamic Frame, Hydraulic Disc Brakes, electronic shifting, widerange 1X drivetrain, Tubeless compatible Carbon Clincher wheels, Large-ish tubeless Tires (28s), Non-Round 1X chainring, Power Meter, and of course a Perfect Dialed in Fit. With a "planted" feeling while cornering/descending at high speeds and incredibly smooth ride over bumps, this bike is at least as fast as it looks, and yet just as comfortable as it is fast. While this bike has plenty of bling, all of it is intentional, truly functional, and adds to the bottom line ride experience of the bike. As always, we place the rider's Fit First above other aspects (color, brand of favorite pro rider, what your friends ride, etc.) of a bike. "If the bike don't Fit, you will probably just quit......"
4 fit horribly, 3 fit ok, and 3 fit fairly well. 6 had carbon wheels, 4 had alloy wheels. 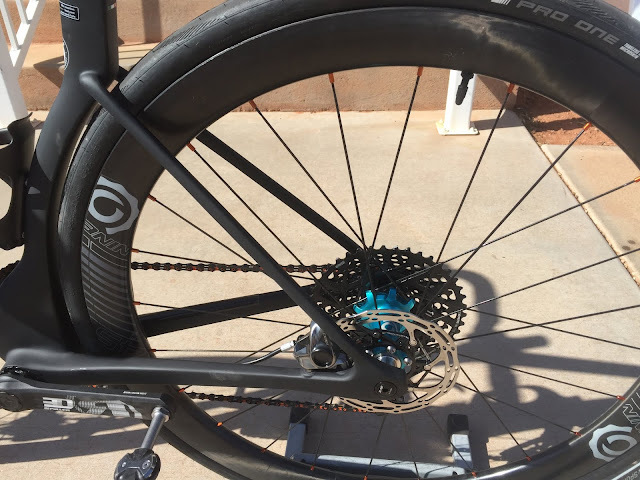 6 had electronic shifting, 4 had mechanical. 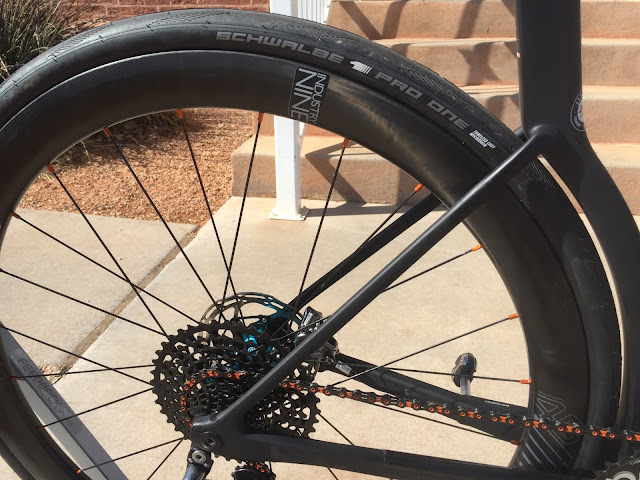 7 had disc brakes, 3 had rim brakes. 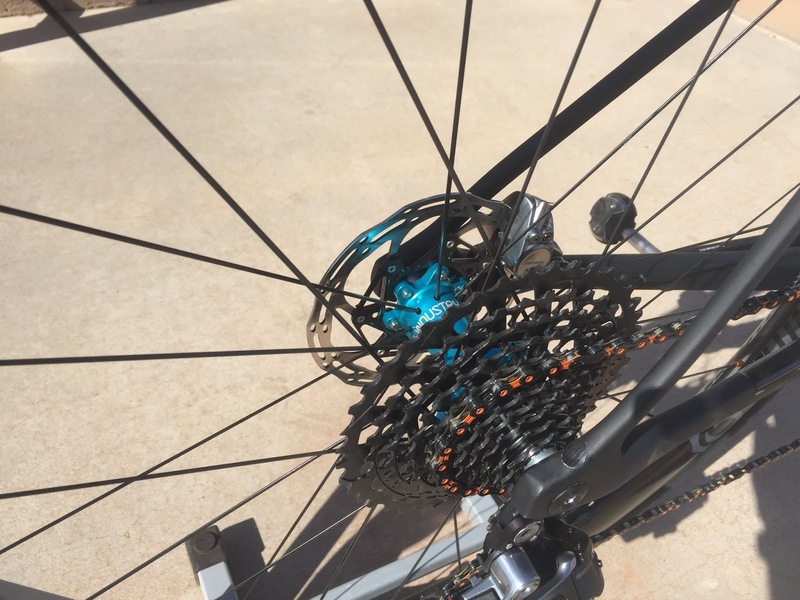 4 had SRAM, 6 had shimano. 3 had painful saddles, 3 had OK saddles, 2 had good saddles, and 2 had great saddles. During the test ride process, which probably spans multiple days/weeks, how will you discern ALL possible variables to determine which is the best bike for you, not to mention the best fitting bike for you? 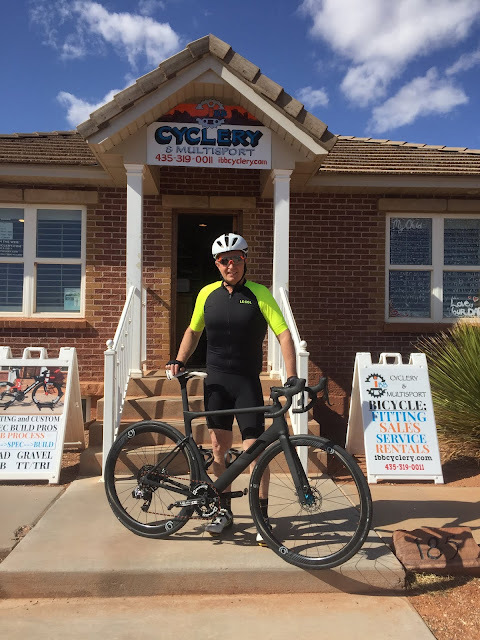 Back to our original question: How did we know Marty's 3T Strada would fit him so extremely well without taking a single test ride? 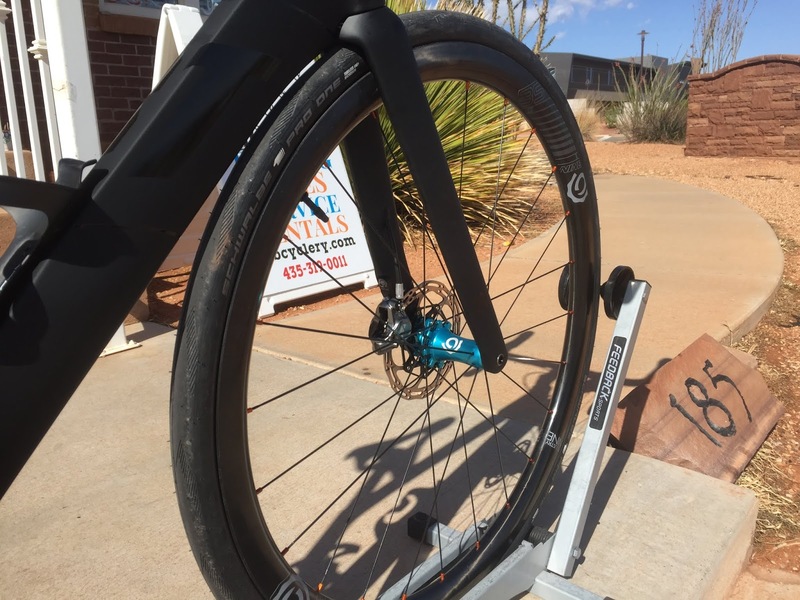 We started in our studio with Step 1: Bike Fit. 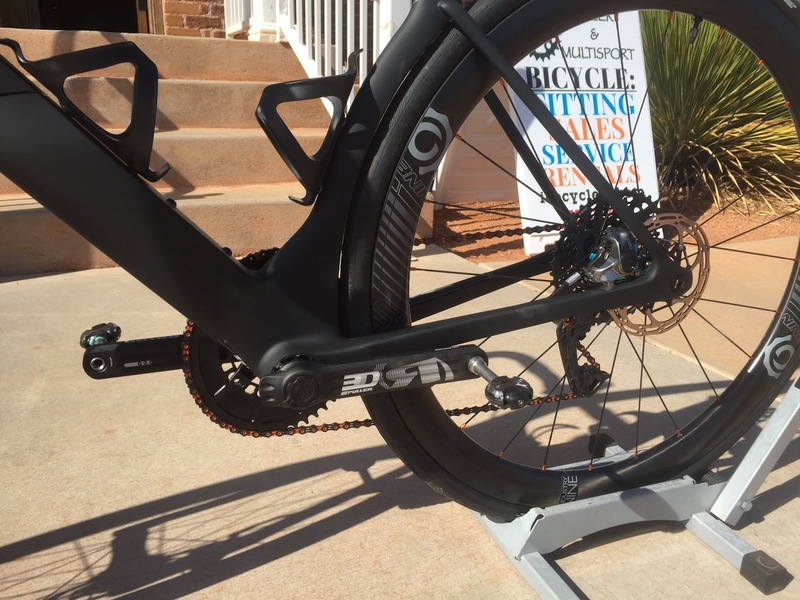 For us, that means 2-3 hours of cutting-edge, Watts-Based Dynamic Fitting, utilizing our Purely Custom Fitting Bike (aka Mechanical Bull.....). In an IBB Fit Session, Kirk and Charity first address the cleats/pedals/shoes interface, then focus on saddle choice/tilt. Next we move into the fun part - making dynamic saddle/bar stack/reach changes while the rider pedals (and suffers a little.....) under a controllable load. Lastly we confirm crank length by testing out different length cranks at equivalent wattages. The next step in our process is the SPEC'ing process which includes formatting the rider's new found fit coordinates (from step 1) into bike size and geometry as well as stem length, handlebar geometry, crank length, saddle choice, gearing, wheel/tire choice, etc.... This can take anywhere from 45 minutes up to hours or even weeks to think about, consider, ponder, digest, and ultimately decide. 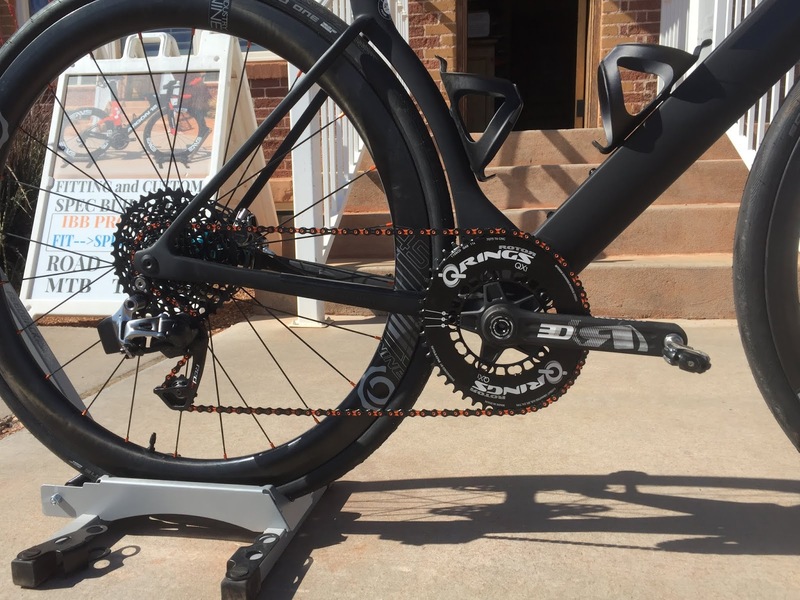 As leading field experts, and with international reputation, we are best in the business at spec'ing bikes within the framework of proper bike fit coordinates being the backdrop of our spec'ing decisions. The Final Step in the IBB Process is the Build Process. Who else do you want building up your precisely tuned machine other than the most detail-oriented experts with the most experience, passion, and mechanical know-how you could possible find?! 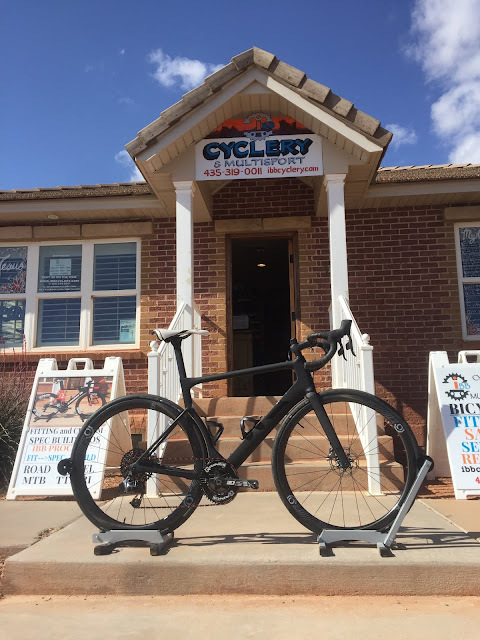 In Bike Builds, there is no such thing as a small or unimportant detail, and we take the time and care to build your bike up as if it were our very own. Browse our gallery of customer bikes, visit our shop, or give us a call and you will quickly discover our high level of passion, competence, experience, and commitment to excellence. Enjoy the remaining photos of this 3T Strada 1X Custom Creation!